This is the third bodyshop delivered to Gemini in Sydney alone and the first to kick off 2015! Symach is supporting Gemini in its strong development plan in Australia with the opening of many new state of the art facilities scheduled in 2015. The Sydney facility has been remodeled using the latest in Symach equipment and will be fully operational by February, the new shop will produce about 60 repairs per week using the FixLine repair process. The new shop using FixLine repair process will deliver a considerable reduction in the repair costs and a massive reduction key to key time to 1.5 days on average for all drivable vehicles. 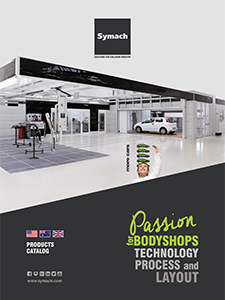 Osvaldo Bergaglio CEO We are working in full harmony with Jim Timuss for the creation of all of Gemini’s new bodyshops; they are very complex projects in which we have developed innovative solutions to meet the needs of a multinational group as Gemini. We have a dedicated team of technicians and trainers to better support these projects where we do not just provide the equipment, but we see an active part in achieving the same objectives as GEMINI, quality repairs, best in industry customer service and drastically reduced delivery times for repairs. Jim Timuss Acquisition Director Symach have assisted greatly in the remodeling of this existing business in Sydney and we look forward to reaping the rewards for year to come. The majority of our facilities have the Symach equipment installed and we receive greater efficiencies and through put with their equipment and process. All the new facilities on the drawing board for 2015 will use the latest in technology which in our opinion is Symach.